Immunotherapy is revolutionizing cancer treatment, but many patients do not respond to current approaches or relapse after an initial response. A better understanding of cancer immunology is needed to improve responses and develop new drugs for cancer care. A major goal of the lab is to identify the molecular and cellular factors that influence tumor sensitivity and resistance to immune surveillance with the goal of translating this knowledge in to new treatment options. We are particularly interested in how the immunophenotype of cancer cells is controlled to enable escape from immune clearance. We are also interested in understanding the influence of the myeloid compartment - specifically macrophages and dendritic cells - in regulating tumor immunity. We recently developed a novel vector and cell barcoding technology which operates at the protein level (Wroblewska, Dhainaut et al. Cell 2018) and can facilitate high-dimensional CRISPR genomics. We synthesized modules encoding triplet combinations of linear epitopes to generate 100s of unique protein barcodes (Pro-Codes!). Through the combinatorial design, we could generate 364 unique Pro-Codes which required just 14 antibodies to detect. By operating at the protein level, the Pro-Codes can be detected by techniques such as flow cytometry and mass cytometry (CyTOF), which provide single cell resolution. In a recent study, we showed that each Pro-Codes can be paired with different CRISPR gRNAs, and used to simultaneously analyze multiple phenotypic markers, including phospho-signaling, on dozens of knockouts. We are currently utilizing the Pro-Code technology to decipher genotype-phenotype connections in the immune system and cancer. Schematic of a Pro-Code/CRISPR screen (From Wroblewska, Dhainaut et al. 2018). Images from Agudo et al. showing the Lgr5+ intestinal stem cells being cleared by the Jedi T cells but the Lgr5+ hair follicle stem cells being spared in the same mice. The immune system’s interaction with many cell populations is still not well defined, and yet these relations influence the development of autoimmunity, clearance of infections, and control of malignancy. Of particular relevance are the adult tissue stem cells. These cells are essential for homeostasis and repair of many tissues. They can also acquire mutations over a life-time, which makes them potential targets for immune editing. We have been carrying out studies to understand how CD8+ T cells interact with different populations of stem cells. Our most recent studies indicate not all stem cells are treated equally by the immune system (Agudo et al. Immunity 2018). Whereas stem cells in the gut, ovary, and mammary gland were subject to T cell clearance, stem cells in the hair follicle and muscle were completely resistant. Resistance was mediated by loss of antigen presentation, which occurred when the stem cells entered quiescence. Interestingly, similar findings have now been reported in cancer cells that entered dormancy. We are trying to understand how proliferation and antigen presentation are linked in some cell types, and to understand how T cells interact with other stem cell populations. To help us better understand how T cells interact with different cell type, we developed the Jedi (Just eGFP Death Inducing) mouse (Agudo et al. Nature Biotech 2015). The T cells in the Jedi mouse have a T cell receptor (TCR) specific for the immunodominant epitope of GFP loaded on to MHC class I. Jedi T cells can be used to study how T cells interact with GFP expressing cells, or even used to deplete GFP-expressing populations. By turning GFP in to a model antigen, we can take advantage of the 100s of GFP expressing mice, cell lines, and pathogens to study and visualize immune responses in novel ways. 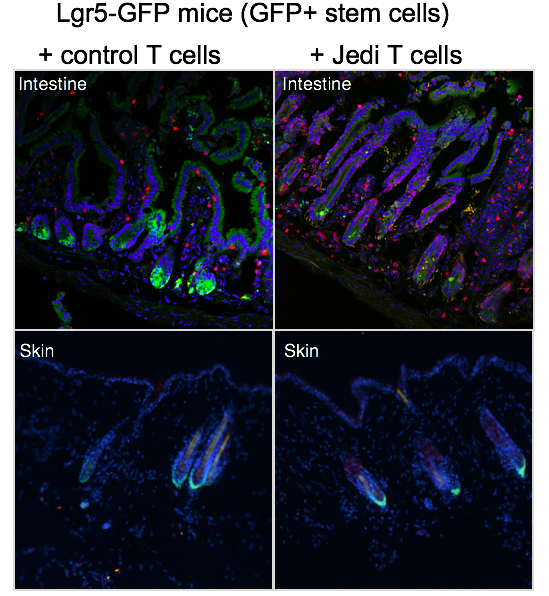 Jedi T cell elimination of GFP expressing pancreatic beta cells (far right) induces type I diabetes. Jedi mouse depiction (left) from here. Our lab is particularly interested in deciphering the molecular regulation of dendritic cell (DC) and macrophage differentiation and function under steady-state and disease conditions. With the lab of Dr. Miriam Merad, we helped identify defining gene expression signatures of different dendritic cell subsets (Miller et al. Nature Immunol 2012), and we identified a microRNA/signaling axis that regulates the innate response to nucleic acids through the control of plasmacytoid DC biology (Agudo et al. Nature Immunol 2014). Our lab is also a member of the Immunological Genome (ImmGen) Project, which has established widely used resources detailing the gene expression landscape of the immune system (immgen.org). We recently finished putting together an atlas of microRNA expression across the immune system. Please visit ImmGen’s miRNA expression browser if you are interested in the dataset. With the Naldini lab, we developed a novel technology for controlling the expression and tissue tropism of therapeutic vectors and viruses (Brown et al. Nature Medicine 2006, Brown et al. Nature Biotech 2007, Brown et al. Blood 2007). Specifically, we showed that incorporating target sites for microRNA in to a gene delivery vector resulted in suppression of the vector in cells that naturally expressed the microRNA. This provided a widely applicable strategy to turn off vectors and viruses in specific cell types or cell states. microRNA-based targeting has been used by numerous labs, including our own, to improve experimental therapeutics for applications ranging from the treatment of genetic disease to cancer oncolytics (Brown et al. Nature Reviews Genetics 2009). MicroRNA (miRNA) are an abundant class of short, non-coding RNAs that were discovered just over a decade ago, and are now understood to be important regulators of gene expression. Hundreds of miRNAs are encoded in the human genome, and each cell type and cell state has been reported to express a unique profile of miRNA. Our lab is trying to understand the relationship between miRNA concentration and target regulation. We have shown that many miRNAs that are detectably expressed in a cell have little to no activity (Brown et al. Nat Biotech 2007, Mullokandov, Baccarini, Ruzo et al. Nature Meth 2012). In some cases this appears to be because the miRNA’s abundance is below a threshold concentration. However, there are also post-transcriptional mechanisms controlling miRNA activity independent of the miRNA’s concentration, including the abundance of target, which we and others have shown can saturate a miRNA and even affect the miRNA’s stability (Baccarini et al. Curr Biol 2011).